I met Sarah at an inner tribal pow-wow in Big Bear, California and she graciously agreed to be my model. 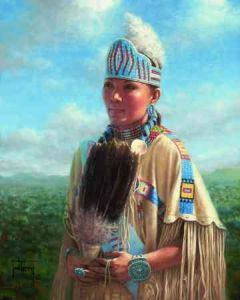 Sarah was chosen as the 2004 Cheyenne Tribal Princess not only for her beauty but for her many talents as well. She hand-crafted her entire wardrobe from stitching of her buckskins to the intricate beadwork and jewelry. She is a lovely young lady who shines as a glowing example of her proud Cheyenne heritage.